Lodgepole cone beetle Conophthorus ponderosae, from here. 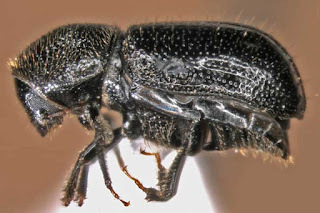 Conophthorus is a North American genus of bark beetles feeding on seeds in cones of Pinus species (Wood 1986). Characters (from Wood 1986): Body length 2.2–4.1 mm. Sutures 1 and 2 of antennal club aseptate and clearly marked by grooves and rows of setae; basal margins of pronotum marked by a finely raised line, lateral margins rounded without raised line, pronotal asperities continuing in lateral areas to base.